While in the prototype phase of making a board game, you’ll want to reduce the cost of materials and be able to produce a quick playable version of your game. When I started to make my first board game I realized that I needed cards. 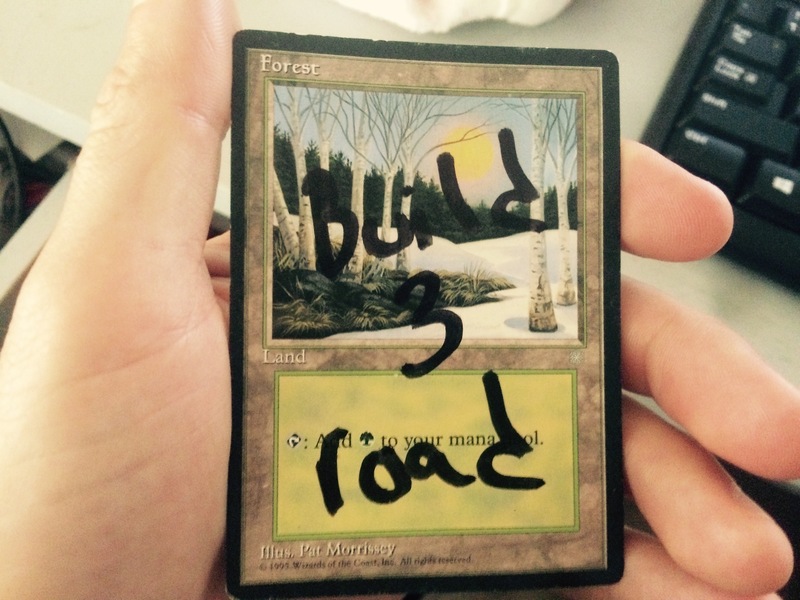 As the image above suggests, I grabbed old Magic the Gathering cards and wrote over them. They didn’t look pretty, but they got the job done. Since then I have found a better looking (yet still cheap) way of making playing cards. Get yourself plastic card sleeves. You can find them cheap online ($5 for 500). These will be what holds your cards together and protects them from being ripped to shreds when your buddy shows off his shuffling skills. Create your cards using computer software (Photoshop, Google Docs, GIMP) and print them on regular paper. The hardest part is creating your card design, but hopefully you (or a friend) has the capacity to do so. Print up your sweet looking cards and cut them out. Use Old Cards as Backers & You’re Finished. If you want to make your cards sturdier and easier to shuffle, grab some old cards (playing cards, old Pokemon cards, etc.) and use them as a backing behind your printed cards. This will give them some weight. You can also purchase some blank cards here to use as backers. Put the backer and your printed card in the sleeve, and you’ve got yourself a cheap and simple way of making cards. What’s your trick to making cheap cards for your board game? Answer in the comments below or in our Facebook Community!